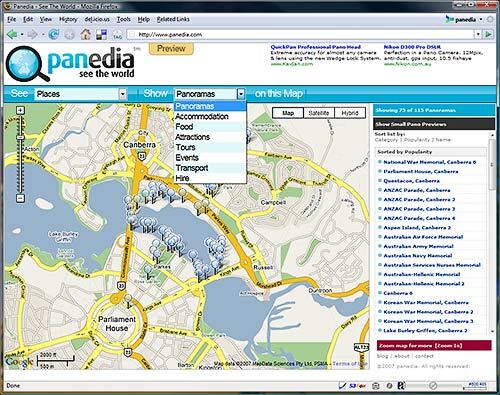 We just updated the Panedia Preview with 20,000 new markers for Accommodation, Food, Attractions… you get the idea. I’ve also been working through my backlog of Panoramas (in my spare time 😉 ) and we now have over 1500 panos on the site, with a LOT more still to come. Audio is still seriously lagging, but we’ll get to that. Click this image for the Panedia Preview. If you’ve not visited Panedia in the last couple of weeks, we’ve added Canberra (The Nations Capital), Adelaide, Melbourne CBD, Geelong, Robe, Beachport & and some of the Great Ocean Rd – where the weather was unfortunately not kind when I was shooting. Yes, I’d like an object movie of a savory Aussie meat pie!